Mr. Iwata also stated that even if the Wii meets Nintendo’s sales projections, it will have little impact on Nintendo’s profit…as far as short term is concerned. Pokemon will have wi-fi worldwide voicechat. 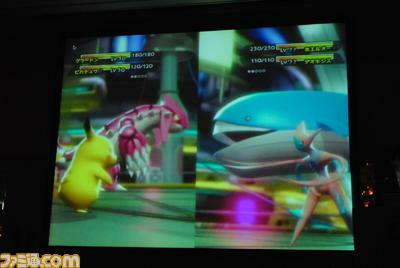 Pokemon Battle Revolution will be out a few months after Pearl/Diamond and will link with the DS game. As long as we can reserve the Wii before September, it should be ok for everyone. The price of this system should not be a huge concern because it will be cost effective for all. If the graphics of Pokemon Battle Revolution were in-game, then this should shut the graphic whores up because I can't think of any Wii game that looks as good as that. Actually, that IS ingame. Iwata said it, and there is a video of it. if it is or if its not? im not much of a pokemon player but i will be buying this game. as long as its fun im ok with it. GFX look awesome. I just hope they make it ''The Pokemon game we've all been waiting for''. I didn't know there was a Pokemon game we've all been waiting for :) but this one does look exciting even if its just the graphics. the next step is to make a "ds player" like the game boy player for the gamecube,cause i will never get a ds(parents...****)and my life(as a gamer)will be perfect:)! i wish they would make a pokemon game with a grand theft auto type engine. That would be amazing! i can just imagine it! they should make it a free range game included with the battling with online players, that would be sweet. id like to try to catch pokemon and auctually go through the pokemon world 3D instead of just battling. i could see how id get tierd of doing the same thing over and over again. but i guess when it comes out we'll see what its all about. maybe it wont be repetative.